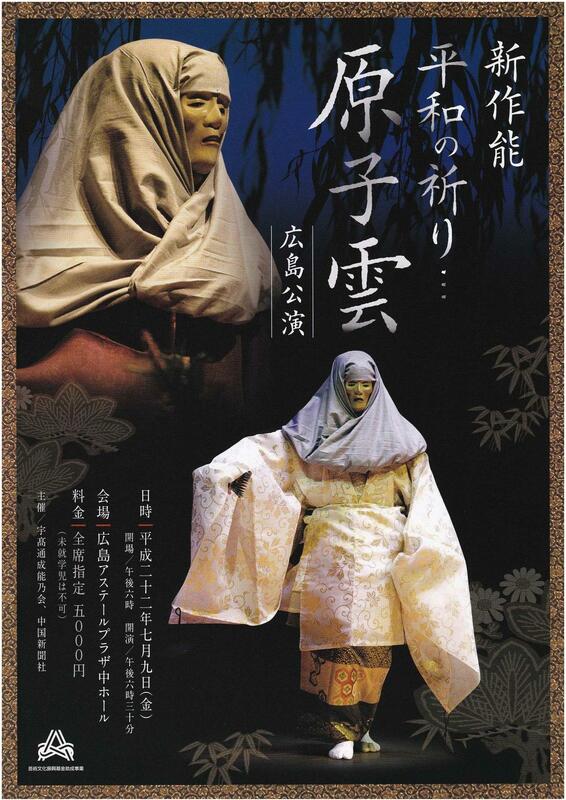 This year the National Noh Theatre in Tokyo is celebrating its 30th anniversary. The article on the first page of the February issue of the Nogaku Times reminded me of something I wanted to blog about a month ago or so, after a friend (journalist Okada Naoko) gave me a heads up about it: the first performance to open the special programme will be philosopher Umehara Takeshi’s ‘super-Noh’ Zeami (April 15 2013), featuring Kanze Actor Umewaka Gensho. The play was recently performed at the Kanze Theatre in Kyoto, though I could not go (it was a Wednesday, and I had okeiko). As Umehara explains in an interview for the Asahi Asian Watch, in order for Noh to be able to speak to a broader audience, it is important to modernise its language. As Noh audiences are progressively ageing, actors and critics alike are concerned about what will be of Noh in the near future. Since the Noh establishment draws almost the entirety of its resources from the aficionados who buy seasonal passes, donate to fangroups and study as amateurs, no generational turnover means jeopardising the survival of the art. Umehara’s answer to the question of how to bring new spectators to Noh is modernising its language. “Its outdated words prevent people from enjoying Noh. If spectators cannot understand the dialogues, naturally they cannot enjoy Noh.” Umehara says (in translation). I am concerned with the health of Noh spectatorship as much as Umehara is, but I am not convinced by his proposal to modernise the language. Saying that not understanding the dialogues ‘naturally’ leads to not understanding is an oversimplification to say the least. There is so much more in Noh to enjoy besides poetry. But of course one of its most important elements is the poetry that constitutes its literary basis. How does modernised Shakespeare sound to you? Sure, most people don’t understand Noh poetry (even if you knew how the verses go, Noh pronunciation distorts the words so much it is hard to follow anyway). The question that comes to mind is – what would my aesthetic experience be if the language were so familiar that I understood everything? I am not sure that ‘understanding’ is crucial to aesthetic appreciation, at least not in the way Umehara seems to put it. “The strength of classical performing arts is their excellent techniques to grab their audiences’ attention, which have been polished over a long period. Using modern-day words, they can grab the hearts of a wide range of people,” Umehara says. Yes, and those techniques clearly stopped addressing the popular audience several centuries ago, when Noh became the art of the aristocracy, thus refining its aesthetics in ways that would have been unthinkable outside the intellectual milieu of which it became an essential component. Do we want Noh to speak the language of dorama? I say that we can leave this to other performing arts. The beauty of Noh lies in the undefined, that is, in its poetry. I wish Noh playhouses still used candles or gas-lights. There’s too much light on stage these days. 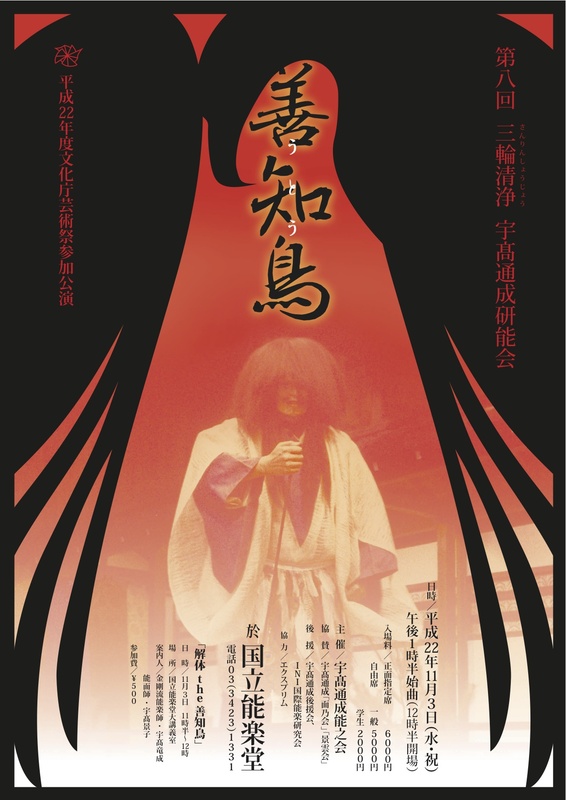 Back from Japan and heavily jet-lagged as usual, I was wandering the many Noh-related blog pages when I bumped into 天河伝説殺人事件 (Tenkawa Densetsu Satsujin Jiken) a 1991 thriller by Ichikawa Kon, the director of The Burmese Harp, Tokyo Olympiad and many other legendary films. 天河伝説殺人事件 looks like a standard 80s old-school detective story with the surprising twist of being centred upon homicides related to Noh theatre. I haven’t seen the movie myself but I am about to make an order to Amazon.jp where they seem to have DVD copies of it. It just looks very cool – the retro-sound score, the ossan hat of the protagonist, the terrible オーバー acting technique of the actors… and on top of it, it’s Ichikawa! The review of the All Movie Guide has been published on the New York Times here. Googling a bit I found the trailer uploaded on YouTube. Yesterday (July 9th 2010) Udaka Michishige‘s Genshigumo (原子雲, a newly-written Noh play on the atomic bombing of Hiroshima and Nagasaki) was performed in Hiroshima for the first time. I had the chance to follow Udaka-Sensei, and take part in the introductory speeches of the performance, reading messages from members of the International Noh Institute around the world, and from the William J. Clinton Foundation. The night before the performance, sitting in the lobby of a hotel near the Peace Memorial Park, Udaka was giving an interview for a documentary on Genshigumo. While confessing the state of excitement for finally being able to perform this play in Hiroshima, Udaka described his experience of meeting with the spirits of the casualties of the bombs who, victim of a sudden and unreasonable death, cannot be released from this existential plane and be reborn. In the play, a Mother is on a journey through memory, looking for her missing daughter who died in the bombing. After the hellish scenes of the bombings are recounted, the Mother finally finds her daughter reborn as a willow tree. Yesterday night I observed the audience watching this play for the first time. I felt the atmosphere was very tense, and the gazes of the spectators revealed that while observing the performance on stage, their thoughts were wandering elsewhere, leaving the hall and reaching out above the sky over Hiroshima. As in the classic Noh style, when the narration of the events reaches its culmination, emotions also reach the limit of verbal explicability: it is the moment when words give way to music and dance. The haya-mai dance symbolises the complex feelings of grief and happiness of the Mother who is finally reunited with her daughter, now reborn as a willow tree. While until this point the spectators where plunged into a tense atmosphere, attentively listening to the narrative part, when the jo-no-mai dance started, only a few could restrain from letting go of their emotions. I think this passage was the peak of the performance and made me wonder if in order to express such a deep message, with all its individual and universal resonances, words were not superfluous, after all. 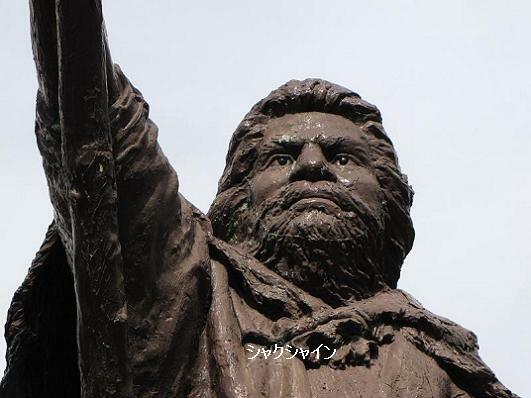 Genshigumo is not a historical play, aimed at re-enacting those tragic events in a narrative style. 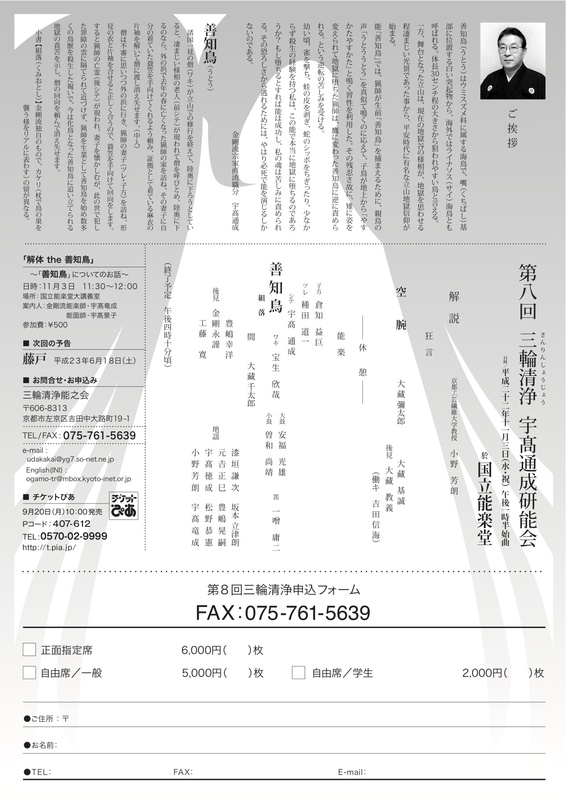 Following the tradition of the pieces of the classic repertory, Genshigumo is rather a requiem for the victims of the bombs, and an invitation to the audience to take part in this prayer for peace. 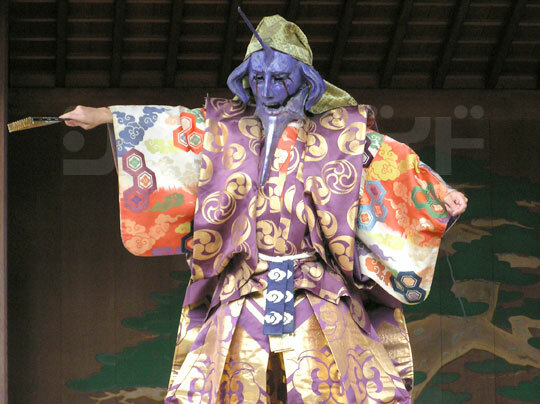 Noh theatre has been transmitting the ethos of Japan (its literature, its philosophy and history) throughout six centuries: it is therefore natural that even recent events such as World War II and its tragic epilogue are incorporated in the tradition of Noh. 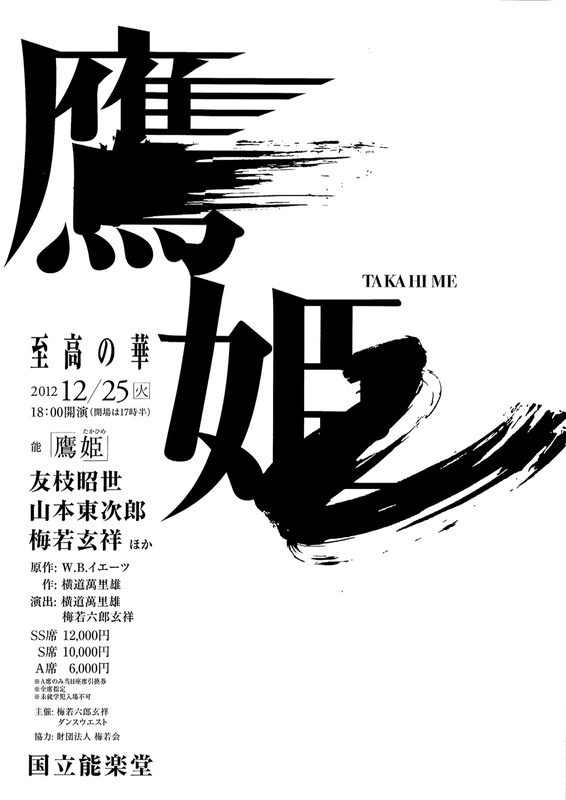 I wish this new play will eventually become part of the official canon of Noh, and will be performed by other actors in the future. Some might wonder how it is possible to render the horrors of war through the subtle beauty of Noh. How can we ‘enjoy’ the horror? While watching Genshigumo I realised how its beauty (and the beauty of Noh as an artistic means of expression) transcends earthly pleasures (the mere aisthesia) and allows the spectator to reach out to a higher level of meaning. Genshigumo is, more than anything else, a prayer offered to those suffering spirits trapped between this and the other world. At the same time, it is a ritual, a vehicle to transmit the memory of the bombings, and a chance for us and for the generations to come to reflect on the absurdity of war. July 9 (Friday), 2010 6:30 p.m. ~ 8:30 p.m.
Genshigumo (‘The Atomic Cloud’), Udaka Michishige’s third newly-written noh play (新作能), composed as requiem for the victims of the atomic bombs, will be performed in Hiroshima for the first time. I had the pleasure to attend performances of Genshigumo in Paris, Dresden and Berlin in 2007, when the Udaka-kai was touring Europe. 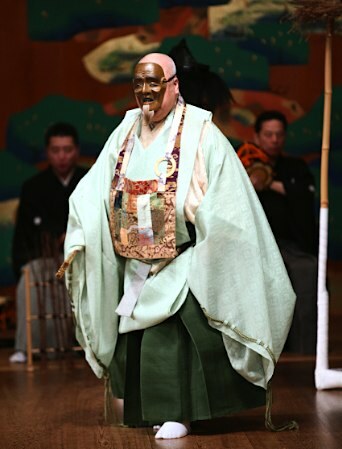 The experience of watching a Noh play performed in the traditional style based on such recent historical facts is particularly strong, and inspired several reflections. While watching the different characters of the play recounting the tragic events of the bombing of Hiroshima in highly poetic language and beautifully stylised movements, I realised how much Noh theatre’s aesthetic conventions are suitable to portray a story of such historical but also emotional relevance. The austere style of Noh, which does not indulge in easy heart-tearing devices, plunges the audience in the solemn atmosphere of a requiem, while maintaining the detachment necessary in order to consciously reflect on what war and its casualties mean. I am looking forward to joining in this prayer. Here the link to the original article.